When RV camping at most locations in our northern territories, consider it backcountry camping. Come prepared with any supplies you would need to camp off the grid for at least few days. Gas stations are fewer and more expensive, and the weather doesn’t always cooperate when you venture off the main roads. At the same time, though, come prepared to see sights you won’t see anywhere else. That’s the beauty of road tripping and adventuring into Canada’s quieter destinations! First Nations Heritage meets the Klondike Gold Rush in Dawson City, Yukon, a mining hub in the north. Just outside the city, outdoorsy people escape to Tombstone Territorial Park for gorgeous mountain views. Come prepared, though—this park is essentially backcountry hiking with very few established trails. Although the views are worth the challenge, hikers are advised to be ready for all elements and animal encounters. The most popular mountains within Tombstone Territorial Park are located within the Ogilvie Mountains: Tombstone Mountain and Mount Monolith. Built on the banks of the Yukon River, there’s a reason why Fort Selkirk is a designated Yukon Heritage Site. This isolated area packs the history of Canada’s early expansion as a gold rush trading post. Even before the gold rush era, archeological evidence points to life at the townsite for over 8000 years—even some to point to late-prehistoric use! Nearby, travellers find the Fort Selkirk Volcanic Field—the natural wonder of the north. No one is quite sure when the last volcano erupted, but we do know that Volcano Mountain’s lava flows are only a few centuries old. Probably the best part about RVing in the Yukon is the empty highways. Just you, your wheels, and endless views. The interior of Kluane National Park, like a lot of the parks in Canada’s Northern half, is only accessible by foot or plane. However, there are a few RV campgrounds just around the National Park’s edges, so visitors can plan day trips into the wild. 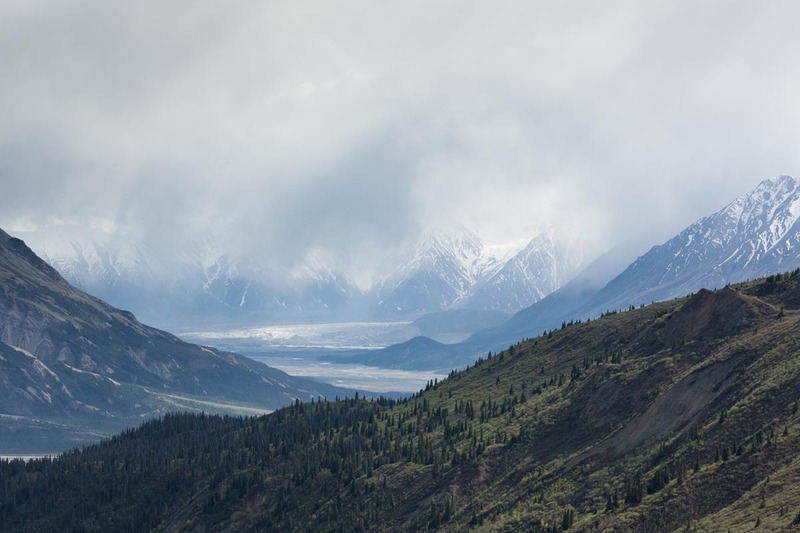 Kluane National Park is home to Canada’s highest mountain peak, and North America’s largest glacier. There are also lots of grizzlies, lakes, and winding rivers. For a relaxing getaway, explore the trails or lounge at the beach on Watson Lake. If you like history, Sign Post Forest is a made-made must-see as well. Sign Post Forest is a tribute to the town’s beginnings. The US Army of Engineers posted directional signs to their hometowns and points of interest while building the Alaska Highway. One man was injured and taken to Watson Lake, and he brought the sign tradition with him. The original sign of Danville, Illinois, is no longer there, but 72,000 signs make up the current Sign Post Forest in Watson Lake. This one is a bit of a trek for RVers to get to, but it’s worth every second of travel time. Early explorers originally though Nahanni’s terrain too rugged to conquer. Now, it is accessible by plane, guided hike, or guided canoe. Park your RV near Fort Simpson or Fort Liard in the Northwest Territories, or Munch Lake in Northern British Columbia. Daily round-trip flights run from these locations into Nahinni National Park, an adventurer’s paradise along the continental divide. The tour planes land about a 30-minute walk from Virginia Falls. Alternatively, a more difficult loop takes hikers one hour around the falls, which are twice the height of Niagara in Ontario. Wood Buffalo National Park expands across a large portion of the Alberta-Northwest Territories border. Just as beautiful, but a little more relaxing than the adventures Nahanni promises. Visitors to this park like to walk barefoot through the mud and salt plains—nature’s spa treatment while hiking. The communities in the area work together to manager the massive park and protect its wood buffalo population—the last free-roaming herd in the world. While you might not see other people exploring, you will likely see buffalo out for a stroll. You will find the true wilderness of Canada when you drive north past Edmonton until you come to the last town accessible by the regular road. Yellowknife is built on the shore of Great Slave Lake—the deepest lake in North America. It’s known for its beautiful landscapes and even better fishing. There are a handful of RV parks in and around Yellowknife, but the real experience is by float plane. If you go, book a guided fishing tour that takes you to one of the remote lakes only accessible by plane. You’ll be in for a treat! Along the “Waterfall Route” road trip through the Northwest Territories, RVers can find a haven in Twin Falls Gorge Territorial Park. A favourite spot to rest for the night is Louise Falls Campground, which has only 28 powered sites. Walk the spiral staircase from the campground to the viewpoint for Louise Falls. Louise Falls isn’t the only reason why people like this destination. 400-million-year-old limestone formations line the banks of the Hay River gorge. Other must-sees in this area: Escarpment Creek, and Alexandra Falls. For more destination inspiration and ways to embrace RVing, visit Go RVing Canada blog. Join our community on Facebook, Twitter, Instagram and Pinterest.